As mentioned in the previous article, products in Magento 2 backend consists of 2 factor: Catalog and Category. In this topic, we will discuss more details about Catalog in Magento 2. At first, the term Catalog is used to refer to the products in Magento database. There are several factors for admin to determine when accessing to the data of catalog, namely scope configuration, catalog setting and the root category which is assigned to Magento store. Secondly, it contains products which are available or offered for sale, as well as those which are not enabled or not available for sale currently. The next interesting thing about catalog is that all products in the database in the backend can be accessed through the catalog grid. In case your Magento store has multiple websites, each one of them can have a different choice of choosing products for sale from the same database. Besides, the word Catalog has another more narrow definition in sales, and it is used to refer to a special choice of available items for sale. For instance, you are running a discount promotion, so you might create a saleoff catalog for this promotion; or a catalog for new products in your Magento store. When discussing about it, we might need to mention 3 included factors: catalog workspace, catalog URLs and using a flat catalog. However, please wait for the next coming topics for detailed user guide of these factor in catalog. Like a printed one, the content of catalog in Magento 2 has the main menu to organize items by category so that customer can find what they need conveniently. The main menu, also known as ‘’top navigation’’ is based on a root category, containing for the menu assigned to your store. Due to that the store view scope is configured for the specific menu options, there will be different menu based on the same root category for each view. Moreover, there is a curated choice of products suitable for your Magento store as you want. In short, here are all the details and reviews of Magento 2 Backend: Catalog we want to share with you. If you find it helpful for you, please Like, Share and Subscribe to keep updating for more upcoming blogs! How Much Do You Know About Product Menu in Magento 2? Products, the most necessary factor in business in general and in e-commerce in specific. Of course, in Magento 2 platform, we cannot ignore this important factor. When we discuss about products in Magento 2, we have to mention Product Menu, which might not be strange any more to Magento store owners. From the admin panel in Magento 2, products have their own parts for admin to manage. You just need to login your admin account, next open the menu in your left side, and click into Products. Then, there will be Product Menu which provides you with ability to create product, category; manage product and inventory as well as content of catalog conveniently. The Product Menu in Magento 2 is divided into 2 options: Catalog and Category. 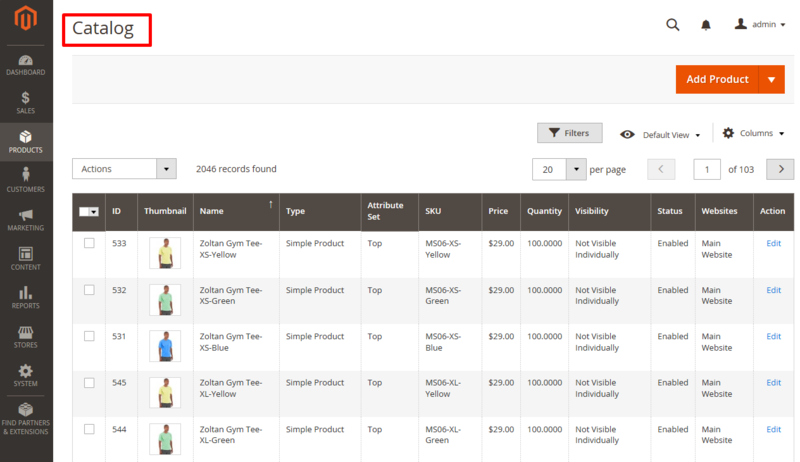 When click Product menu in the backend, you have to choose selecting Catalog or Category depending on your purpose. Regarding to product catalog in Magento 2, Catalog is used to create new products and manage inventory of products. Admin can create all types of Magento product, manage product or edit them. For more details about Catalog in Magento 2, please wait for the next article. In the backend of Magento 2, Category allows admin to create the structure of category. One interesting thing is that category structure is actually the foundation of the navigation of Magento store. The store’s navigation is understood like the simple group of website page’s links which allow customers to navigate around the Magento site. Obviously, the store’s navigation plays an important role in online store. For more detailed information about Category in Magento 2, please wait for the next blog. We have presented about Product Menu in Magento 2. We hope that this article can show you useful information to select the appropriate extension for your online shop. If you find it helpful for you, please Like, Share and Subscribe to keep updating for more upcoming blogs! Author adminPosted on June 19, 2017 February 5, 2018 Categories CatalogTags catalog in magento 2, category in magento 2, magento, magento 2, product menu, product menu in magento 21 Comment on How Much Do You Know About Product Menu in Magento 2? How to Master Catalog Workspace in Magento 2? Are you using Magento 2? And you find it difficult to manage your online products? Don’t worry!! This article will provide you detail information about Product Catalog in Magento 2. After reading this, you will absolutely get the key to Catalog Workspace in Magento 2. Where can you find Product Catalog? From the backend mode in Magento 2, you can easily manage the Catalog as you want to. Firstly, you need to sign up with the admin account. Then click on Product category. There you can see three sub-categories: Inventory, Catalog and Categories. Pick up Catalog and you are in Magento 2 Catalog Workspace. What do you have in Catalog Workspace? Once you are in the Catalog Workspace, you can see all of products listed on The Catalog grid. It allows you to control over every single products on the list: either edit the existing product or add a new one. Add product: If you want to create a new product, click on the button. The down arrow provide you with 6 types of product: Simple, Configurable, Group, Virtual, Bundle, and Downloadable Product. You can choose one of them for your new product. [Default] View: Show the current layout. You can simply choose another grid column view (if any is available) or make up a new one. Actions: Product list actions offers three options: Delete, Change Status, and Update Attributes. Checkbox : You can choose the product one by one or choose all of them by selecting “Select All” option. There also is “Select all on this page” choice, which help you choose all products on the current page. ID: A unique number for a single product. Thumbnail: Show a small picture of product. Name: Name of the product. Type: Type of the product. Attribute Set: Show which categories the product belongs to. SKU: A unique code of product in inventory. Quantity: Indicate the current number of product in stock. Visibility: Show the place that a product can be seen in the catalog: Not Visible Individually/Catalog/Search/or Catalog, Search. Price: Unit price of one product. Action: Click “edit” to come to edit mode. Now you definitely can master the Product Catalog on our Magento 2! Author ThắmPosted on June 15, 2017 February 5, 2018 Categories CatalogTags Catalog, Catalog Workspace, magento 2, ProductLeave a comment on How to Master Catalog Workspace in Magento 2? Magento 2 provides a great system to manage catalog, create catalog, category and other functions that directly relates to product management. This blog will provide a quick overview on product section of Magento 2 admin panel. Please navigate to Admin => Sidebar => Products => Catalog. Products section contains Catalog and Categories. The catalog presents a list of products on your store. You can create all product types here: simple product, configurable product, bundle product, grouped product, virtual product, and downloadable product. In each product edit page, admin can easily make a media gallery for the products, including both images and videos. The media gallery shows multiple images, video and the swatches of that product. This part is placed under the main image and each thumbnail will display a variation of the product. Please navigate to Admin => Sidebar => Products => Categories. The category is a good way to categorize the product catalog into a logic and suitable structure to navigate your store. The categories also make it easier for customers to shop and find items in your store. Attributes describe characteristics of product and decide the input control for the product. Basically, the product attributes define products, such as price, color, image, name, size, SKU, status, weight, feature… These attributes contribute to providing additional information on the product page. Please navigate to Admin => sidebar => Stores => Attributes => Product. Admin can easily create new attributes or add new attribute set for products in Magento 2. If you find it helpful for you, please Like, Share and Subscribe to keep updating for more upcoming blogs!